Why bother searching for narrative structure in this back-catalogue show when you’ve got more than three dozen back-to-back Beatles hits, each containing enough lyrical and vocal power to wow an audience. After all, when heard live on stage instead of on vinyl or digital, Yesterday and Eleanor Rigby are almost like self-contained mini-dramas, while the first few notes of Please Please Me virtually unleash a brand-new rash of Beatlemania in the stalls. And having notched up three West End stints and extensive UK and overseas tours, this nostalgic concert-style entertainment has more than earned its crowd-pleasing medals. 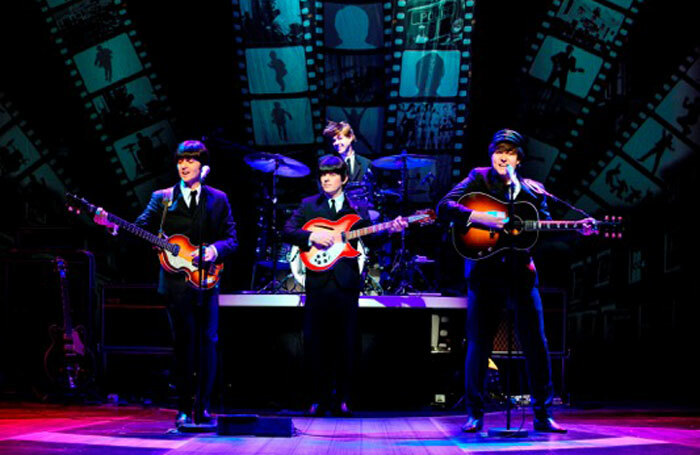 Nevertheless, the two teams of John, Paul, George and Ringo impersonators have now returned to Liverpool, arguably the show’s spiritual home, for a special five-week run. Aside from the show’s glorious golden-oldie atmosphere, there is an additional retro tingle here when an evening tracing the band’s rise from Love Me Do in 1963 to Abbey Road in 1969, opens with the group’s early mop-top days in the Cavern Club, just a stone’s throw away. Vintage video footage unashamedly recalls that bygone age – and gives the cast a chance to change costumes and dodgy wigs. But even when coping with fluffy sound levels, the musicianship on offer is first class, especially in a more intimate second act acoustic section, with Emanuele Angeletti’s boyish Paul stealing an edge vocally, Paul Canning’s John channelling convincing Lennon-ish attitude, Paul Mannion’s George giving a stunning solo in While My Guitar Gently Weeps and Luke Roberts happily bashing snare drums as Ringo.